When you list your event on Skiddle you benefit from being on the UK's biggest events guide and the 2 million passing visitors every month. For an extra push, you can also use our additional event promotion tools below. Dedicated emails advertising your event to 1,000s of our visitors. Target recipients by location, age, gender, music preferences and favourite djs/bands. Pick a data and supply the artwork, and we'll handle everything else. Our display advertising is great for raising awareness of your next event. From MPU and Leaderboard up to large format billboard banners, prices start at just £99. Banners can also be targetted geographically to give you the most effective campaign for your budget. 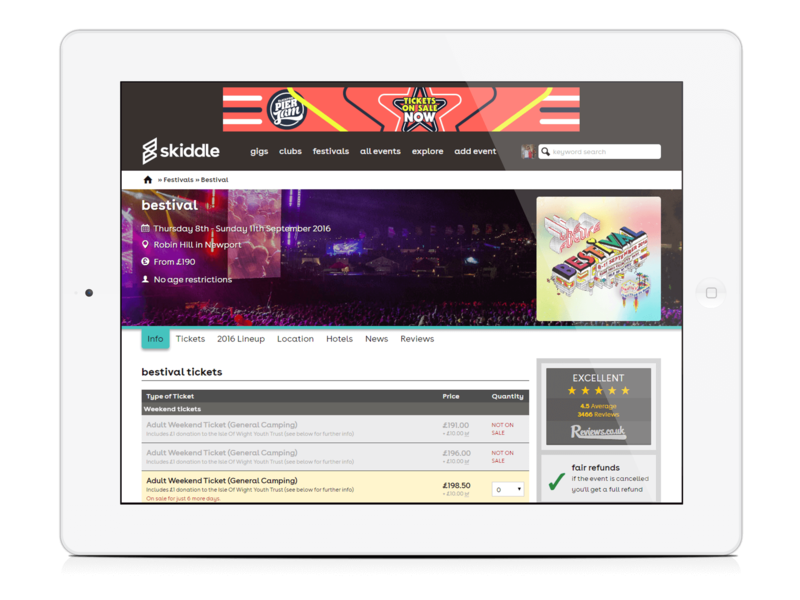 Skiddle has been recognised as the leading UK website for event promotion and ticket sales since 2001. 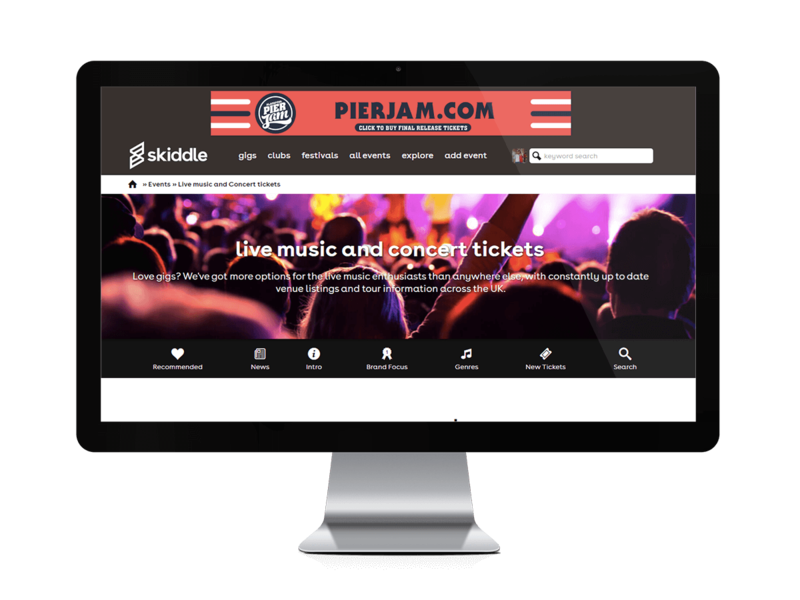 Over 50,000 event promoters regularly use our Promotion Centre, promoting and selling tickets for hundreds of thousands of events, to tens of millions of visitors that use Skiddle.com and our partners/affiliates each year. Sync your Skiddle and Facebook RSVPs - when you sell tickets online and a customer buys a ticket, we'll add them to your Facebook attendees. We'll also show your full attendee list on your Skiddle page to encourage friends to buy tickets. There is no extra cost for our social media tools! Track mentions of your event page automatically. When customers complete their transaction, they'll be prompted to share their ticket purchase with a tweet to help spread the word, plus follow your own twitter account to boost your following. 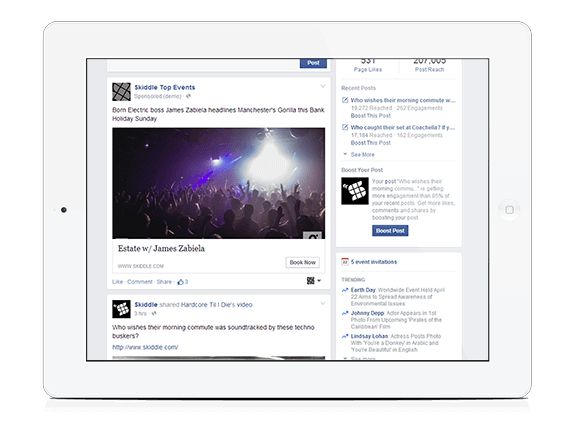 Run targetted Facebook and Twitter ads through Skiddle - retarget Facebook users who have viewed your event page but not yet purchased. By showing ads on social media pages, you can retarget them at the point where they spend most of their online time.